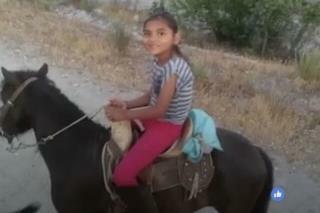 (Newser) – A young California girl was fatally crushed by a horse this week while out riding with members of her family. According to the Mercury News, police identified the 12-year-old victim as Yolanda Ceja. Yolanda was reportedly on an outing with her family at a Lake View Terrace ranch when the horse she was riding with her 4-year-old little sister reared, tossing the two of them to the ground. The horse then fell onto the girls. They were rushed to a hospital, where Yolanda was pronounced dead Tuesday night. Her little sister was listed in critical condition, likely with a collapsed lung, but is expected to survive, per KABC. I was almost crushed by a cougar once, okay twice, maybe three times, and I survived, only to be attacked again. What incredibly unfortunate luck. My condolences to the family and friends. Poor little girl - and her family.